No servers for you to maintain. Easy to scale as your traffic & data storage needs change. GAE is now a part of Google Cloud Platform. Google Cloud Platform is build on the same infrastructure that allows Google to return billions of search results in milliseconds, serve 6 billion hours of YouTube video per month and provide storage for 425 million Gmail users! 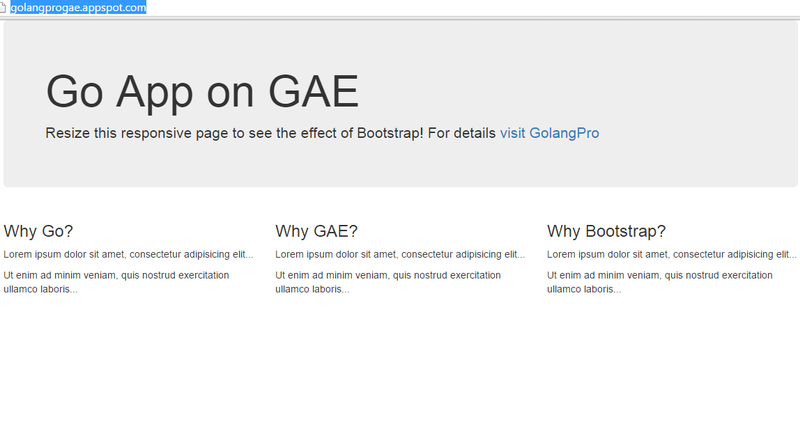 Do You Want to See the Live Page that I Deployed on GAE? Visit http://golangprogae.appspot.com/. This is a responsive page build on Bootstrap framework. P.S. - Add App Engine Go SDK directory to your PATH environment. Also, Go requires Python 2.7x, Download it from here, if it's not already installed in your machine. Go to your working directory. Create a new project directory and name it anything you may like, I've named it gogae. Inside this project directory, create a file named app.yaml. Copy the following code and paste it to your app.yaml file. Remember, later on you've to edit the application name marked in red (golangprogae) with your own Project Id that you'll create in GAE interface at the end of this tutorial. Info. - app.yaml contains GAE application configuration. In the above RefCode# 1, you can change the version. GAE has the ability to render different versions based on your preference, if you wish to go for A/B testing. I'm using a windows machine. The Development Server will display the web page that we just build using Go. How to Deploy to Google App Engine? 1. Log into Google Developer Console. For those who are yet to signup, at the time of writing this there's a $ 300 credit promo for FREE to try out Google Cloud Platform. 2. Create a new project. Note down the Project Id. In my case the project Id is golangprogae. 3. Open the file named app.yaml. You've to edit the project Id before deployment, see RefCode# 1 above (in the beginning of this article). Edit the name of the application marked in red and replace with your Project Id. How was it? How can I improve this? Please share your thoughts. Go supports anonymous or embedded field - i.e. a field without a name but with a type. You can say that the type itself is a name. Why Anonymous or Embedded Fields or Composition? Yes, Embedded fields, Composition or Anonymous fields are different names for same concept. If you're familiar with object oriented programming you can relate an anonymous or embedded field with Inheritance and its single biggest advantage is code re-usability. What Happens in Case of a Field with the Same Name in Two Structs? A field named location exists in both the structs (person and employee). What happens when you call empProfile.location? Which location gets a precedence? As it is evident from the above output, the child field (i.e. the location from employee) takes precedence over the parent (i.e. person). In Object Oriented parlance this provides a way to override a field or method. If you liked it, spread the word about it. Happy coding!